#STATECAPTURE: GLOVES ARE OFF - AGRIZZI SPILLS THE BEANS! Bosasa former executive Angelo Agrizzi has provided a video that shows a vault with a box allegedly full of money as evidence. The vault was reportedly used to keep cash for bribes and confidential business files. Agrizzi told the State Capture Commission that the person seen in the video taking money out of the vault is Bosasa CFO Andris van Tonder. He said the safe was also used to keep the legitimate and unlawful documents in the vault as well. According to Agrizzi, Bosasa had well over eight vaults that were used primarily to stash cash for bribes. He further told the commission that throughout his time at Bosasa, which is a period of 19 years - he has never seen those grey bags carrying anything other than money. “Chair they are very identifiable and they are probably the size of an A4 envelope. People might say they is it not a courier bag, because you used a courier. These were specifc bags and were brought only for that reason,” Agrizzi said. Agrizzi told the commission that if one safe was full the safe would be empty, which is why there would two safes and a drop safe. “We would have to drop money in the drop safe,” Agrizzi said. Agrizzi raised a concern, to the commission - he says he has been receiving numerous threats. He explained to the commission that 4 years ago, he hired a former cop at Bosasa, and was made a director at the company. “Four years ago I employed a gentleman from the SAPS, he’s name was either captain or Colonel Solomon Segale – I was a bit concerned yesterday when I went for my lunch break. He was standing outside with a group of policemen,” Agrizzi said. He said Segale didn’t go through the normal accreditation and he slipped in with his old police I.D card. 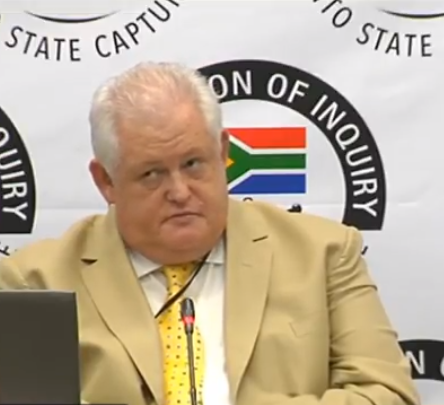 On Wednesday, Agrizzi said from 1999 until 2016, when he left Bosasa, the company was involved in corrupt activities, money laundering and tender fraud.